“Last year was a drought year and the only crop we harvested was mucuna. This year we experienced water logging and again the only crop we harvested was mucuna,” says farmer Nlovu from Nkayi district in Zimbabwe. More than 75% of smallholder farmers in Zimbabwe depend on crop-livestock farming and use cereal crop residues to supplement livestock feed. The residue is low in nutrition and inadequate to maintain animal health during dry periods, affecting household nutrition and bringing down the market value of livestock. Lack of market access, prolonged dry season, livestock death, and poor income are key challenges faced by smallholder farmers and climate change is threatening agricultural productivity. In these circumstances, what solutions do smallholder farmers have to seize opportunities and break out of poverty? Leveraging on the ‘Innovation Platform’ approach, ZimCLIFS project has introduced high protein, drought-tolerant legume fodder crops like mucuna as a solution for marketing livestock benefiting 60,000 farmers. Prior to ZimCLIFS in 2012, food deficit was rampant and opportunities to improve incomes were meager, in Nkayi and Gwanda districts. Now farmers are able to diversify their income source by selling quality crop and livestock products to emerging urban markets, thanks to Innovation Platforms. 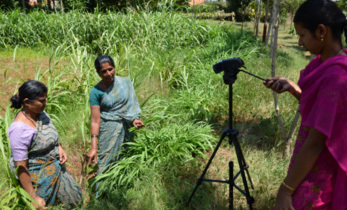 This market-oriented crop-livestock integration drove technology uptake and encouraged farmers to take it a step further by experimenting crop rotation with mucuna, integrating it with markets and strategically feeding mucuna. The Innovation Platform (IP) is an inclusive, participatory space through which stakeholders – farmers, agriculture extension workers, traders, NGOs, development workers and government personnel – come together to identify market opportunities and adopt context specific innovations. “Engaging with scientists gives us an opportunity to communicate the challenges faced by farmers. We need to come up with crop production techniques so farmers can produce sustainably, meeting their food requirement,”says Dumisani Nyoni, Head of Agricultural Technical and Extension Services Department (AGRITEX), Ministry of Agriculture Mechanization and Irrigation Development, Zimbabwe. IP meetings not only foster innovative ideas to break socio-economic barriers but also build confidence and initiate agreements among stakeholders. 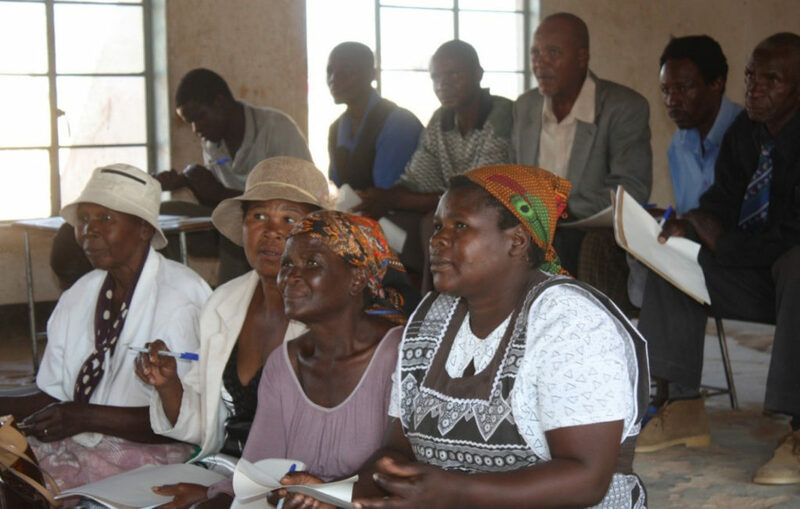 For instance, in Nkayi and Gwanda districts, ZimCLIFS initiated a series of community meetings with extension officers from AGRITEX and the Department of Livestock Production and Development (DLPD) to identify challenges and opportunities for crop-livestock integration. Lead farmers were identified and trained on production technologies, marketing and self-organization. Mucuna was widely adopted because of the market-oriented ‘farmer-to-farmer’ training approach. 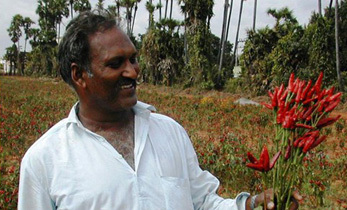 Farmers indulged in their own experimentation by planting mucuna in rotation with cereals. Two years later farmers discovered that soil was significantly fertile and resistant to the deadly Striga weed bringing down production costs. This powerful information was actively shared in IP meetings. 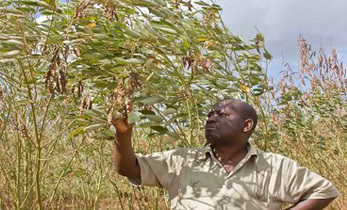 Farmers realized that mucuna seeds also have a market and started selling to other farmers and development organizations such as Welthungerhilfe through EXTRA Project; World Vision International through ENSURE program; United Nations Development Programme through ECRAS project; and Fintrac. Indicative of the value farmers place on forage plants, mucuna seeds are sold at USD 1.5 to USD 3/kg in the region. Excess seeds were crushed/roasted and preferentially fed to weak cattle and those recovering from diseases like foot and mouth disease. 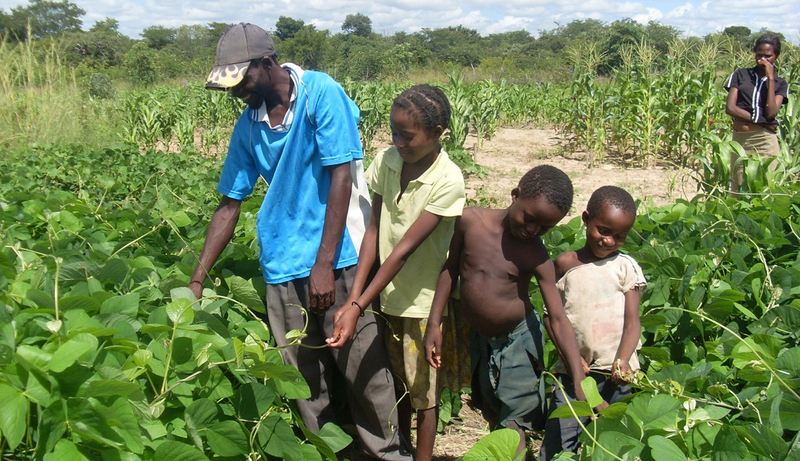 The success of mucuna triggered more new initiatives in Nkayi and Gwanda districts – solar-driven fodder gardens, infrastructure rehabilitation for pen feeding cattle and marketing. In this process, farmers, NGOs and extension workers learnt how best to use and adapt technologies which stimulated further experimentation. Another example of change in farming systems is the IP-introduced improved seeds. Thandiwe Moyo, a smallholder farmer from Nkayi earns three times more after accessing improved groundnut varieties from the International Crops Research Institute for the Semi-Arid Tropics through ZimCLIFS project. “Groundnut yields have increased to 1 t/ha from the usual 0.3 t/ha and I sell at high value markets for 0.75 USD/kg instead of 0.25 USD/kg at local markets,” she says. She feeds her livestock with homemade feed (cereal crop residue mixed with groundnut residue and mucuna) near her homestead, which has reduced labor for herding. As animals do not need to go far for grazing, they remain healthy, reproduce more, and produce more milk. Through IP instilled confidence in Goromonzi – the International Livestock Research Institute-led project site, farmer Mukumba and his wife decided to go against expensive commercial feed by pen fattening cattle. They strategized market entry by purchasing cattle during the dry season and selling later during Christmas. Pen fattened cattle adds 40% more value. The couple offers a market for farmers looking to sell livestock. 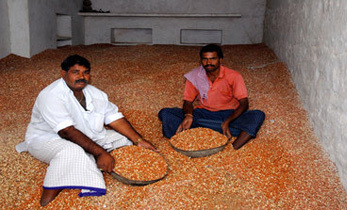 However, the greatest bottleneck for them is to process large volumes of crop residues required for feeding. 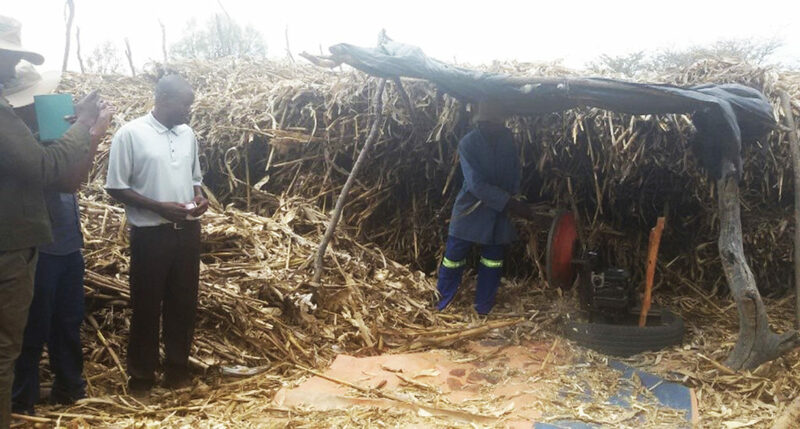 Through his own initiative, farmer Brian from Murehwa has found a solution to break this bottleneck: He converted a diesel operating water pump into a crop residue chopper! Crop residue chopper developed by farmer Brian, credit goes to Sabine Homann-Kee Tui. It is one thing to develop technologies and innovate but equally important to enhance adoption of such technologies. The most important ZimCLIFS achievement for Simangaliphi Ngwabi, Head-Provincial Department of Livestock Production and Development Matabeleland South, was that the IPs instilled ownership of innovations among stakeholders. “If stakeholders themselves generate technologies, the scaling up and uptake will be easy, as they build on their vision and not on someone else’s. The ZimCLIFS technologies were meaningful, farmers were eager to learn about them, and they easily adopted them,” she says. Visible changes are occurring in the farming systems. Women frequently share their knowledge on farm management in IP meetings. They are consulted more and involved in land allocation, input use, sale of commodities and income expenditure decisions. Successful farmers demonstrate their technologies and extension officers take it upon themselves to facilitate farmer-to-farmer visits from within and outside the district. In Nkayi, extension officers mediated the sales of mucuna seed to individual buyers, research and development projects. Extension services have become more relevant as farmers appreciate the value of technologies better. So it works, but is it scalable? 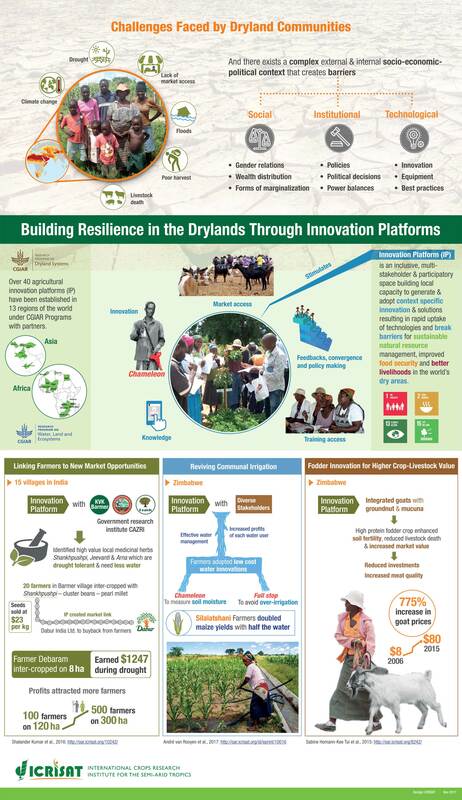 “It is the relevant innovations in the context of market-oriented development plus feedback mechanisms that came out of the Innovation Platform process that we need to bring to scale,” says Andre van Rooyen, Project’s Lead Scientist-ICRISAT. 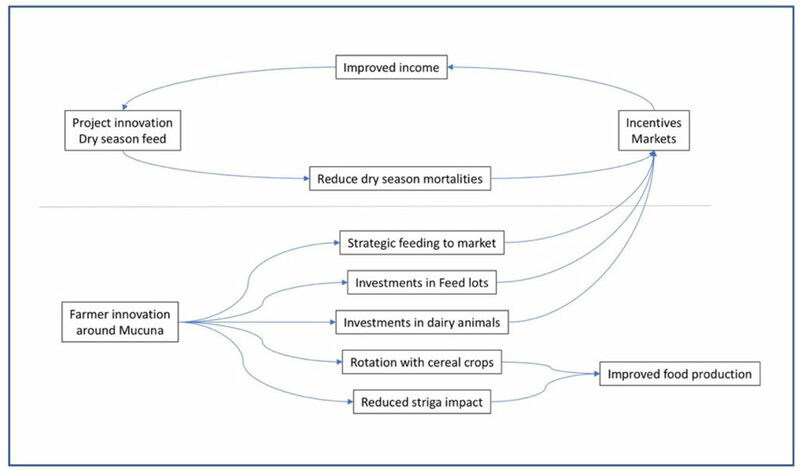 Feedback loops through farmer’s experimentation: While ZimCLIFS introduced mucuna as dry season feed to reduce mortality, farmer’s innovation catalyzed multiple positive effects on the farming system, enhancing food production and market surplus in areas with high climatic risk. 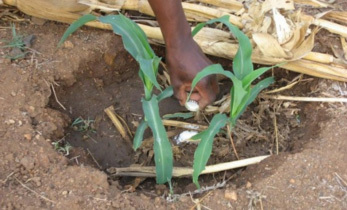 Naturally, a framework for upscaling ZimCLIFS technologies was developed: through horizontal linkages in the form of farmer-to-farmer extension, driven by the project and by spontaneous dissemination of technical options driven by stakeholders; and through vertical linkages in the form of higher level extension with policy makers. Research organizations and development-oriented NGOs deliver ZimCLIFS technologies to a wider area. 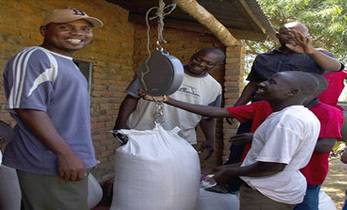 Since the start of ZimCLIFS, collaborations between ICRISAT, Matopos Research Institute, Amalima program of Cultivating New Frontiers in Agriculture, Help Germany, and government extension services, have scaled technical innovations from 2 to 14 districts in Zimbabwe, Mozambique and Malawi benefiting 60,000 farmers. 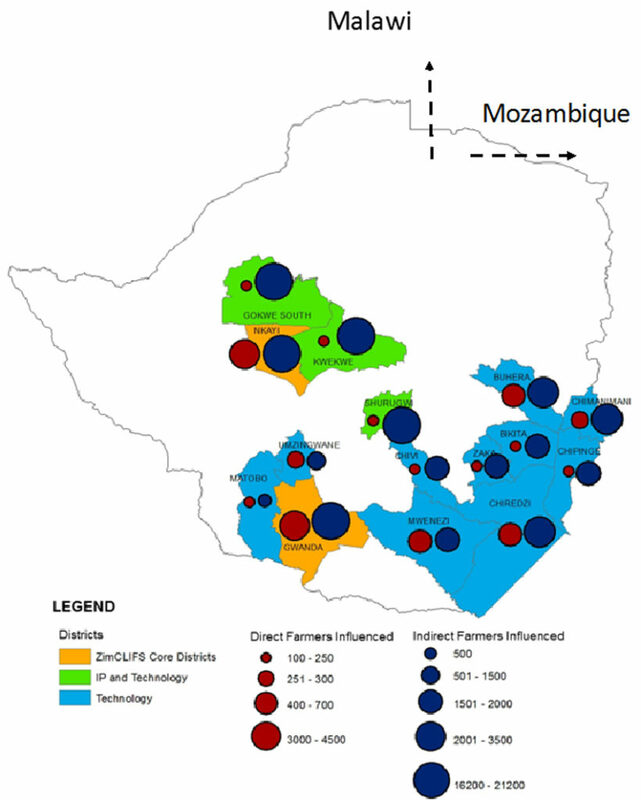 Map showing innovations of the ZimCLIFS Project scaled out in Zimbabwe. ZimCLIFS has successfully presented evidence to policy and decision makers involved in the project. For example, the Zimbabwe Government is now promoting market-oriented crop-livestock production as a lucrative farming activity for smallholder farmers. Special emphasis is on livestock feeding to increase and sustain quality and quantity. “We are looking at a holistic and sustainable production that incorporates the environment, gender and youth into our programs to avoid an environmental catastrophe,” stressed Dr Dumisani Kutywayo, Director – Crops Research, Department of Research and Specialist Services, Ministry of Agriculture Mechanization and Irrigation Development, Zimbabwe. Successful fodder seed multiplication has sparked DLPD’s engagement and fodder technologies are now a component of irrigation schemes in Matabeleland. “Increased fodder production has helped resolve conflicts among users of communal grazing land in two adjacent districts,” adds Ernest Moyo, AGRITEX Extension Officer, Nkayi district. The Innovation Platform approach is a lever for sustainable development outcomes because of its impacts on capacity building, social relations, economic benefits, community action, scientific advancement and the environment. As a participatory space, IPs allow the flow of information which empowers stakeholders to test new strategies and define market opportunities. Integrating Crops and Livestock for Improved Food Security and Livelihoods in Rural Zimbabwe (ZimCLIFS) is a project working to strengthen synergies in crop-livestock farming systems in four districts of Zimbabwe. The project is funded by the Australian Aid Program through the Australian Centre for International Agricultural Research (ACIAR). It is implemented by the International Livestock Research Institute (ILRI) (lead agency) in collaboration with the International Maize and Wheat Improvement Center (CIMMYT); the International Crops Research Institute for the Semi-Arid Tropics (ICRISAT); Australia’s Commonwealth, Scientific and Industrial Research Organisation (CSIRO) Ecosystem Sciences; The University of Queensland; Zimbabwean non-governmental organizations – Community Technology Development Organization (CTDO) and Cluster Agricultural Development Services (CADS); and several departments within the Zimbabwe Ministry of Agriculture, Mechanization and Irrigation Development. Sikhalazo Dube (ILRI), Godfrey Manyawu (ILRI), Siboniso Moyo (ILRI), Andre van Rooyen (ICRISAT), Sabine Homann-Kee Tui (ICRISAT), Isaiah Nyabumbo (CIMMYT), Munyaradzi Mutenje (CIMMYT) Daniel Rodriguez (The University of Queensland) and Niel McLeod (CSIRO).